P.O. Box 1637 - Inn at Schoolhouse Creek is a beautiful wedding venue. Romance, spa, whirlpool tubs, massage, WIFI, fireplaces, beach access, family friendly and pet friendly and so much more check this great web site. Elegant rooms, delicious breakfast, lush gardens, beautifully decorated cottages all to make your getaway relaxing and enjoyable. Visit Inn at Schoolhouse Creek Bed and Breakfast you will enjoy every minute for romance, leisure or business. Specials include celebration package, pampered pooch, hiking package, check out the extended weekend stays this is a time to relax and re-connect please mention when making your reservation. The Day Spa is there for you to be pampered and relax through this ultimate experience. Sauna and hot tub are complimentary 24 hours a day. Take this time to rejuvenate. Click web site below for details, photos and reservations. 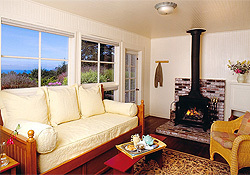 Escape to the coast and discover our distinctive Inn's cottages and rooms offering all the amenities. Unwind and get away from it all. 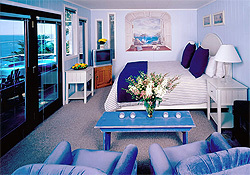 We have ocean views, fireplaces, cliff side cottages, hot tubs, Jacuzzi tubs, bountiful breakfasts, and spa services. Pour a glass of wine, walk on the beach or just sit and watch the sunset and relax. 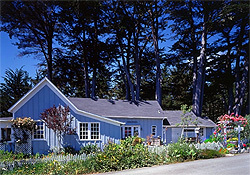 The moment you arrive at the Inn, you'll know this is not just another Mendocino Bed and Breakfast. You will feel like your in good friends' home. The Inn at Schoolhouse Creek has something to offer everyone. It does not matter if you are alone or on a romantic weekend with someone special or a fun-filled weekend with your family, we will make your stay memorable.